Begin your vacation from the best anchorage and popular starting point for luxury yacht charters in Dominica — Prince Rupert Bay. From here a local guide can paddle you up the magical Indian River where the huge swamp bloodwood trees overhang the channel and their roots twist through the banks. Look out for fish, crabs and surprisingly tame herons as the canopy meets to create a natural cathedral. Later explore the now abandoned Fort Shirley in Portsmouth; this 18th century British garrison is now picturesque ruins with lovely views over the Bay. As the daylight begins to fade, head up the hillside at The Champs Bar to watch the sunset across Prince Rupert Bay. Begin your vacation from the best anchorage and popular starting point for luxury yacht charters in Dominica — Prince Rupert Bay. From here a local guide can paddle you up the magical Indian River where the huge swamp bloodwood trees overhang the channel and their roots twist through the banks. Look out for fish, crabs and surprisingly tame herons as the canopy meets to create a natural cathedral. Later explore the now abandoned Fort Shirley in Portsmouth; this 18th century British garrison is now picturesque ruins with lovely views over the Bay. As the daylight begins to fade, head up the hillside at The Champs Bar to watch the sunset across Prince Rupert Bay. Theres so much to see nearby it is worth the extra day at this secluded anchorage to explore inland once more. Close to Portsmouth is the protected Cabrits National Park which covers reefs, wetlands and rainforest. Hire a local guide to help you explore the beautiful rainforest that clothes the island and it will be easy to see why part of the island has been designated a Unesco World Heritage Site. Local guides can tailor hikes for every ability and it's well worth the trip to discover this very different part of the Caribbean. It is so untouched by the modern world, it's said that if Columbus were to come back today, Dominica is the only island he would recognise. Dominica is also unusual in the Caribbean as it has precious few beaches as it's mostly far too steep, but Prince Rupert Bay has a very pleasant one — perfect for relaxing with a sundowner and cooling your toes after a day of jungle trekking. Theres so much to see nearby it is worth the extra day at this secluded anchorage to explore inland once more. Close to Portsmouth is the protected Cabrits National Park which covers reefs, wetlands and rainforest. Hire a local guide to help you explore the beautiful rainforest that clothes the island and it will be easy to see why part of the island has been designated a Unesco World Heritage Site. Local guides can tailor hikes for every ability and it's well worth the trip to discover this very different part of the Caribbean. It is so untouched by the modern world, it's said that if Columbus were to come back today, Dominica is the only island he would recognise. Dominica is also unusual in the Caribbean as it has precious few beaches as it's mostly far too steep, but Prince Rupert Bay has a very pleasant one — perfect for relaxing with a sundowner and cooling your toes after a day of jungle trekking. 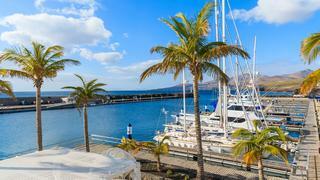 Head back to your yacht for the short cruise south to the middle anchorage, just off the Castaways Hotel in Mero. This lies just a mile or so North of the Macoucherie river. Take the tender down to the entrance to the Macoucherie river, where you can spend the day walking inland along the feeder road. This is a great way to see the sugarcane and mountain scenery. Along the way you can visit some rum distilleries, and there are plenty of pools for cooling off. After a few days of exploration and hiking, you might want to spend the rest of you day simply unwinding in the peace and quiet, and perhaps invent some new rum cocktails. Take the tender down to the entrance to the Macoucherie river, where you can spend the day walking inland along the feeder road. This is a great way to see the sugarcane and mountain scenery. Along the way you can visit some rum distilleries, and there are plenty of pools for cooling off. After a few days of exploration and hiking, you might want to spend the rest of you day simply unwinding in the peace and quiet, and perhaps invent some new rum cocktails. 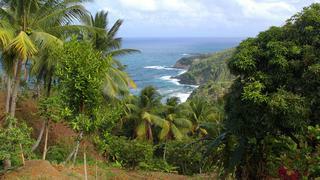 Today cruise down to the south of the island and the main town of Roseau. You might like to spend some time ashore looking at the small boutiques and market, as well as the older buildings and churches. 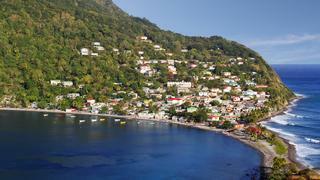 Then you can head to Soufriere Bay to the South, perhaps taking in the sulphur hot springs en route. The bay has excellent snorkelling and diving. 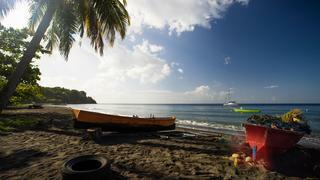 Dominica is famed for its excellent underwater landscape and has some of the best diving spots in the Caribbean. Its steep sides plunge deep into the sea, providing both reef and wall dives and the water is very clear as much of the island is still forested. In the evening head to Roseau to sample a huge range of fine dining restaurants. Today cruise down to the south of the island and the main town of Roseau. You might like to spend some time ashore looking at the small boutiques and market, as well as the older buildings and churches. Then you can head to Soufriere Bay to the South, perhaps taking in the sulphur hot springs en route. The bay has excellent snorkelling and diving. 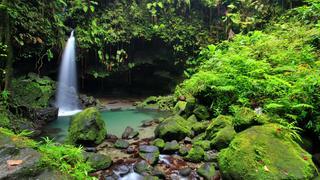 Dominica is famed for its excellent underwater landscape and has some of the best diving spots in the Caribbean. Its steep sides plunge deep into the sea, providing both reef and wall dives and the water is very clear as much of the island is still forested. In the evening head to Roseau to sample a huge range of fine dining restaurants. Once more there are a number of ways to keep busy inland. There are marked trails, or take a guide to show you yet more stunning waterfalls and lakes. Later in the day, when the cruise ship guests are long gone, check out the Rainforest Aerial Tram. This spectacular tour takes you over a suspension bridge across the Breakfast River Gorge where you can admire the 400-foot drop waterfall below you. A 90 minute aerial tram ride gives you a monkeys eye view of the rainforest as you fly through the tree tops accompanied by an expert nature guide. Its no surprise the makers of the Pirates of the Caribbean films chose Dominica for a lot of their filming locations when you see such stunning scenery. Once more there are a number of ways to keep busy inland. There are marked trails, or take a guide to show you yet more stunning waterfalls and lakes. Later in the day, when the cruise ship guests are long gone, check out the Rainforest Aerial Tram. This spectacular tour takes you over a suspension bridge across the Breakfast River Gorge where you can admire the 400-foot drop waterfall below you. A 90 minute aerial tram ride gives you a monkeys eye view of the rainforest as you fly through the tree tops accompanied by an expert nature guide. 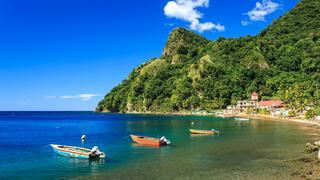 Its no surprise the makers of the Pirates of the Caribbean films chose Dominica for a lot of their filming locations when you see such stunning scenery.
. Alternatively, you may prefer to take the tender back there or to Champagne Beach, where you can dive or snorkel among beautiful fish warm bubbles from underwater geothermal springs. Shoppers may take the last chance to head to Roseau to pick up those final souvenirs. Alternatively, you may prefer to take the tender back there or to Champagne Beach, where you can dive or snorkel among beautiful fish warm bubbles from underwater geothermal springs. Shoppers may take the last chance to head to Roseau to pick up those final souvenirs.